One Minute Monday is our weekly post on a key fact from UKCES research, explained in under one minute. The UK currently has a highly qualified workforce and is set to have one of the most highly skilled populations in the OECD by 2020. However there is evidence of mismatch between these high-level skills and the jobs available in the labour market. Almost 10 per cent of graduates in the UK are employed in lower-skilled occupations (in the standard occupational classification scheme, these are described as "elementary, process and plant" roles). 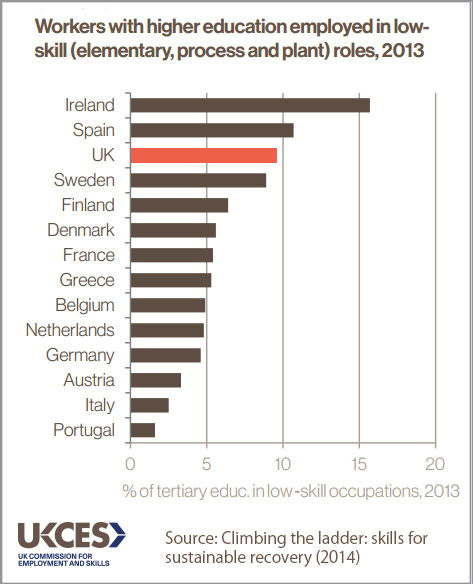 Of OECD countries, only Ireland and Spain have a higher proportion of graduates in low-skill occupations. This mismatch adds up to a huge pool of untapped talent in the UK workforce. That pool has the potential to boost UK productivity and growth if it were put to better use, for instance through the creation of more high skilled jobs or by redesigning current roles to better draw on these skills. To find out more about how the UK could better utilise the skills of its workforce read our full report.